For Rotary District Governor, Missy Eckenberg, responsibilities are focused on Service above Self and this year’s theme – Rotary: Making a Difference. She is used to driving long distances to 55 clubs ranging in size from under 20 to over 400 members and participating in humanitarian service projects. 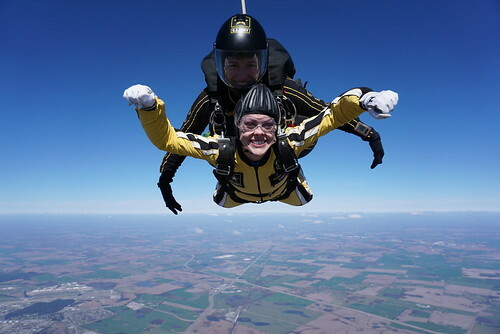 She recently made a difference by “taking a leap of faith” to show her support of the US Army’s 101st Airborne Division. 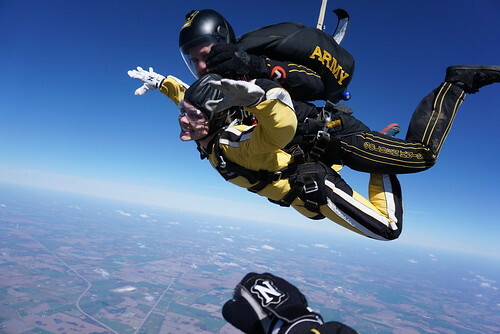 This awe-inspiring experience brings together the 101st Airborne Division (Air Assault), the United States Army Parachute Team, and local community leaders like Eckenberg who are given the opportunity to connect with the Army’s “ambassadors", the Golden Knights. The participant’s life is put directly in the hands of soldiers who demonstrate the positive aspects of teamwork, courage, discipline, professionalism, and excellence. It allows a better understanding of the highly trained women and men of the military. The day started with a safety briefing and TANDEM Jump Camp classroom instruction with the Army Golden Knights, the most formidable parachuting competitors and demonstrators in the world, and afterward the jumps. There are only three Department of Defense-sanctioned aerial demonstration teams: the U.S. Navy Blue Angels, and the U.S. Air Force Thunderbirds, and the U.S. Army Golden Knights. The team is composed of approximately 95 men and women, which includes four parachute units, an aviation unit, and a headquarters. The demonstration teams, which use five dedicated aircraft, perform at more than 100 events per year. The tandem section is known for taking soldiers, celebrities and heads of state, such as the 41st President of the United States, George H. Bush on jumps, and the competition section focuses on winning national and international skydiving events. The Golden Knights have reached a third of our nation by performing live parachute demonstrations for the American public. They have conducted more than 16,000 shows in 50 states and 48 countries, reaching an average of 60,000 people per show. The team has earned the U.S. Army 2,148 gold, 1,117 silver, and 693 bronze medals in national and international competition. Team members have also broken 348 world records.